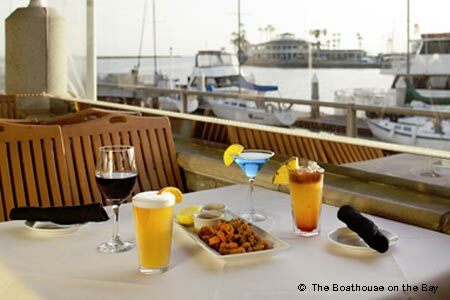 Seafood-centric cuisine with a view of Long Beach's Alamitos Bay marina. : This Long Beach waterfront venue is a throwback to old-school dining motifs. Dark woods and white tablecloths dominate the interior, classic live music fills the space nightly, and brightly hued cocktails and margaritas are slung from the long, narrow bar. Guests like to gather on the outdoor patio to watch boats of various sizes cruise through the adjacent marina and eat executive chef Katsuo Nagasawa’s sushi and sashimi. Fittingly, seafood items such as smoked fish, calamari and day boat scallops dominate the menu. Those who want to explore the land selections can check out the list of steaks and pasta dishes, while several surf ‘n’ turf options are on hand for the best of both worlds. Vintage sweets --- New York cheesecake and crème brûlée --- highlight the desserts. On weekends, diners can enjoy several breakfast items, like homemade corned beef hash, to leisurely ease into their day.